Holachina.com » Excursion to the Palpung Gompa (Babang Monastery or “Little Potala”). 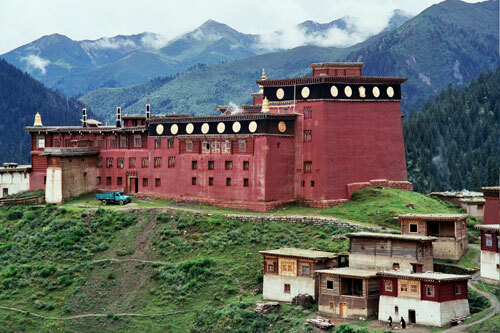 Excursion to the Palpung Gompa (Babang Monastery or “Little Potala”). I asked the friendly monk what they ate in winter when the snows came. He smiled and pointed to the scraggy dogs scrounging around for scraps and the forlorn looking mules that wandered aimlessly in front of the monestary. I looked at him to see if there might be a slight trace of a grin that would confirm he was joking. There wasn’t any grin, he just affirmed that they were quite tasty. I looked out over the mountains and valleys, more remote you could hardly get, I began to believe him. On our third day in Dege we hired a jeep with a driver to take us to Palpung Gompa, Babang in Chinese, otherwise known as “Little Potala”, due to its resemblance to the palace of the Dalai Lama. 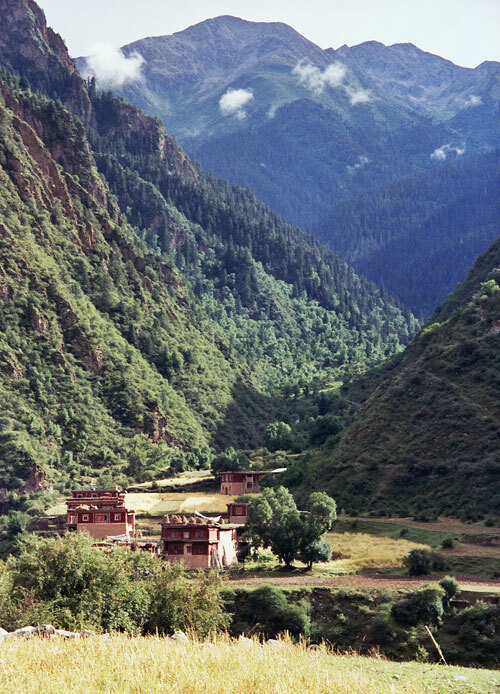 Palpung Gompa is only 70 or 80 kilometres away from Dege, but the situation of the roads is such that it takes us about 4 hours of infernal bumping to cover the distance. 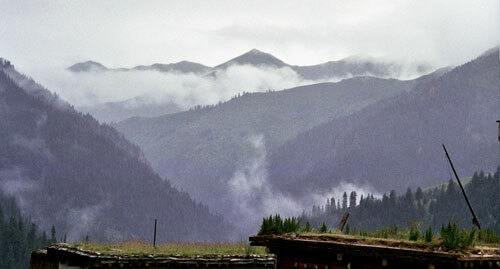 The first half an hour, from Dege town down to the Tibetan border, is sealed and easy. After that, the road gradually deteriorates. 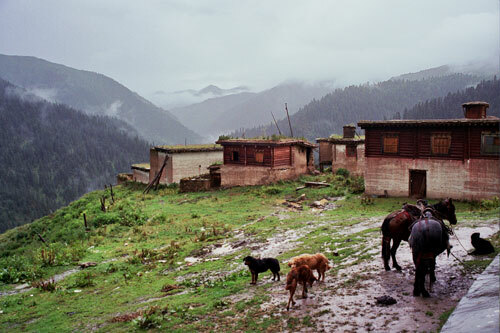 For a while, it follows the river, which forms the border between China and Tibet. Eventually, we turn inland, into a narrow river valley. Now the road is barely a road anymore, but rather a stony track, running alongside, and sometimes through, the water. To our amazement we meet several sturdy flatbed trucks, whose drivers prefer to drive straight up the riverbed. 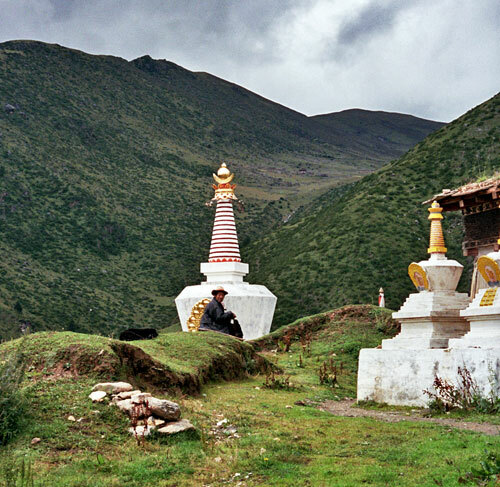 At the end of the ride, we gingerly ease our aching limbs out of the jeep and gaze up at the monastery, standing majestically on top of a hill, flanked by a row of stupas. As we get closer, we can see that Palpung is not just a temple, but rather a whole monastic village, with its own small printing house. 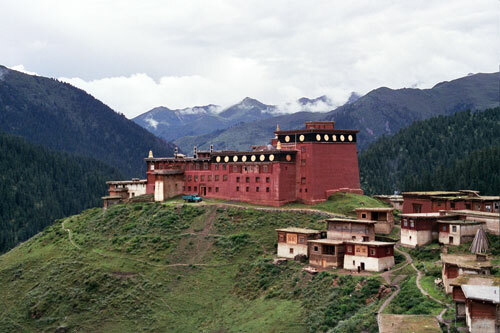 It is traditionally a major teaching centre for the Karma Kagyu sect, and apparently receives many young scholars each year. When we visit the main temple, which has some beautiful but threatening wall paintings of demons holding the wheel of life, we can see signs of recent activity in the form of piles of small hand drums lying around. 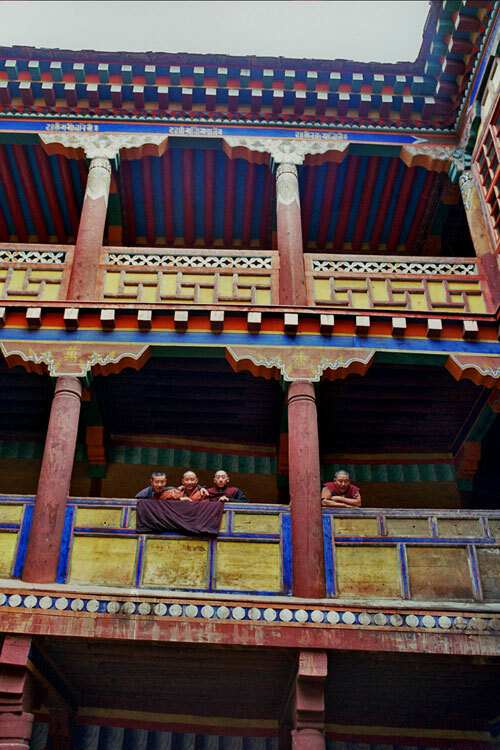 However, on the day of our visit, most of the monks seem to have gone elsewhere, though we can’t understand where or why. 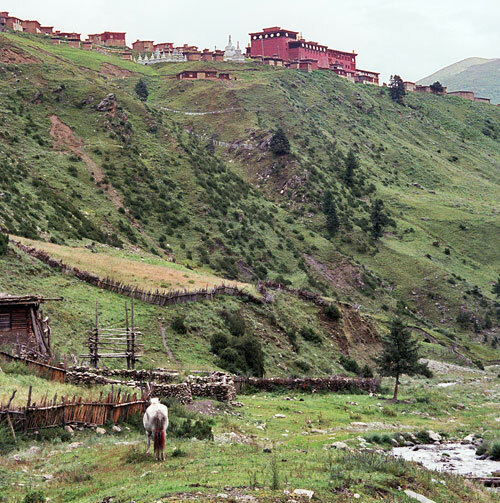 The huge rambling complex, guarded only by a few venerable monks and packs of roaming dogs (which are apparently a staple in the monks’ diet), takes on a mysterious and timeless quality, which makes up for the discomfort of getting there. 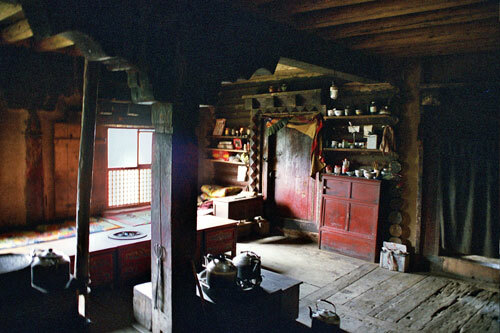 Before taking us on a tour of the village, the monks take us up to a small dark room, just off the kitchen, where we huddle around a small brazier and eat tsampa, the stodgy Tibetan staple of roasted barley mixed with hot water, washed down with yak-butter tea. Apart from the main temple hall and the printing house, there are many buildings to house pilgrims who come there to go into spiritual retreat and meditate. 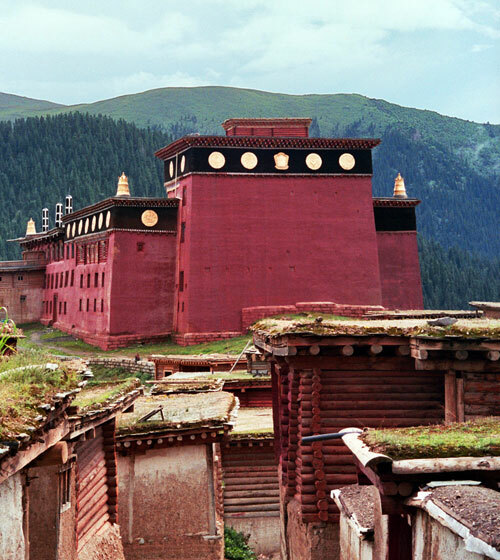 The few younger monks that are around are all engaged in construction and restoration works, a good sign perhaps for the future of Tibetan Buddhism. really looks like heaven came down on earth,in pic its looks like heaven just imagine in reality.